P1 Clothing and Apparel: It's about the message. Life Is Effortless when you are living in your purpose. If you believe in the law of attraction then our brand is perfect for you. Thoughts and words are extremely powerful because we are constantly creating our circumstances by what we say and think in the present. Below is short video show how Dr. Masaru Emoto and others scientist have discovered that simply writing, saying or thinking positive words can transform water molecules in a good or bad way. The fact that our body is mostly made up of water makes everything we say, see, or do in life either damaging or helpful to our overall physical and mental wellness being. We took this same concept and infused it into what we wear. Not only do we market our brand we also market and support other product or brand that is in line with our mission of creating a positive products that create a positive mindset and environment. We create alliances with other brands and companies because change only comes if we take action and unite for a common cause. We believe that the high tide raises all ships. Small businesses and entrepreneurs are growing in record numbers. When we make alliances with each other it only gains more exposure for your product and also helps build long lasting personal relationships. Where does your money go from your purchase? The profits from the sales of P1 Clothing & Apparel go to fund our (Non Profit Organization), OnMyGenius Campaign, based out of Charlotte, NC where we are active in creating a positive environment in the community, schools, and sports. The purchases of our brand is what allows the O.M.G. Campaign to continue to sponsor FREE community events that promote social change. A few of the more recent events that we have partnered with other brands to help bring about the awareness of the true powers of thinking positive. Learn more here. 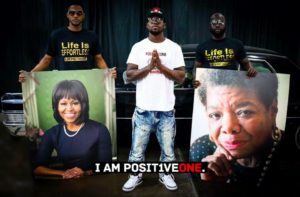 Profits also help fund our PositiveOne Athletics department which currently holds our Free Empowerment and Basketball Skills Clinic every other Sunday or 2 times each month. To learn more click here. When you wear P1 Clothing, you are representing a positive and peaceful state of mind. A peaceful mind is a mind that knows the feeling of its unlimited potential. Everything that we do requires mindfulness, so by bringing awareness to positive thinking we allow ourselves to become open to new opportunities. Opportunities bring experience and experiences brings knowledge of self. When we dig deep and find out the details of ourselves it lights a fire from within and life becomes effortless. Find out more about PositiveOne and its community programs.